Find your way around OS X El Capitan quickly - for all Mac users (iMac, MacBook, MacBook Pro, Mac Mini), whether you're new to the Mac or just upgrading. OS X is the operating system at the heart of Mac computers. The latest version, OS X El Capitan, builds on some of innovative functions and level of performance that were introduced with the previous version, OS X Yosemite, to provide a stylish, effective and powerful operating system for your Mac desktop or laptop computer. Multi-Touch navigation options for getting around in OS X El Capitan. 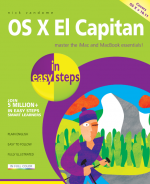 There is also a chapter on troubleshooting and keeping your El Capitan in tiptop shape. Split view functionality, so that you can work with two apps at the same time. A streamlined Mission Control function for managing your open apps and Desktop. An improved Notes app that can be used to add photos, videos, web page addresses and map details from the Maps app. Enhanced Spotlight search functionality that can produce results from an increased number of sources. An updated Mail app that can be used in full-screen and supports swipe gestures for managing your Inbox. Additional editing options in the Photos app. An enhanced Safari app for browsing the web, including an option for pinning your favourite websites so that they are readily available and open in the background. Whether you’re new to the Mac or just upgrading, use this book to master the essentials and then unleash the power of OS X El Capitan.